v1.2 of the English Translation has now been released. A lot of improvements have been made and this is now much more polished than the old version. The minigame crashing issue from v1.0 has been fixed. There are various graphic updates such as for world map names and minigames, and some new hacks added like for the dialog cursor and expanded title screen options. A new ending has also been created which appears after you beat the final boss. I just got into this game, nice to see the translation updated! First question that comes to mind here, did the game just not have an ending? If it did, is one just better translated than the other or is it better looking? I believe the original ending was just a credits role with some images of the characters. I’m curious what has been added in this version. Is it similar to the intro sequence added in Mega Man III Improvement? Update: The ending can be viewed from the main menu of the game. It’s very well done, and just adds some closure. I’ll be sticking with the original ending, but I applaud the hackers for a job well done. Thanks for continuing to support this great game! I just wanted to create an ending for it to do some Snes programming and decided to release this with the English version. There are 2 patches released. Patch v1.1 is just the English translation. Patch v1.2 is the English translation and also has the new ending. Congrats on this and thanks for revisiting another RPGOne release to bring it up to 2018 standards. 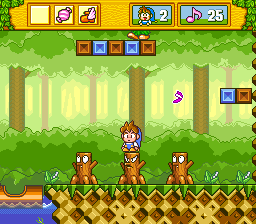 Incidentally, I just realized that this is the same Milon from Milon's Secret Castle, about which I watched one of the more entertaining episodes of the Angry Video Game Nerd recently. I'm glad that this appears to be a fun action-platformer rather than the seemingly frustrating scavenger hunt that was its Famicom predecessor. Big problem, I tried patching this game with the latest update, and now the game won't boot up in Snes9xGX. Same issue with the big update for Magical Quest 3 Starring Mickey and Donald. Oh man, this is my favorite kind of update: one that fixes a long-standing, game-breaking issue, in an important fan translation of a great game I've been meaning to replay on real hardware. Thanks so much for this -- looking forward to enjoying your work. 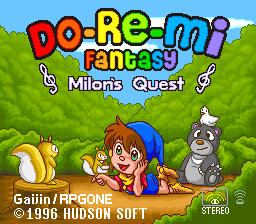 Both Magical Quest 3 and DoReMi Fantasy were well tested with different versions of Snes9X, and they both boot up and work fine on Snes9x-1.52 (which I believe Snes9xGX is based on), and also work on the latest version of Snes9x-1.57. I don't have a wii so can't test those games on Snes9xGX myself. These games have also been tested and work on bsnes and a real Snes. Thanks. Enjoy playing this game, it's a lot of fun.